Nobody knows better than Mary Finneran how to organise a ride-out and barbeque. This Sunday’s event at Hillsborough Farm near Ramelton offers options for all levels of riders (and horses), as well as entertainment for the unmounted followers with their canine friends. Depending on your level of ambition, the rides kick off at 12 noon, 1pm and 1.30pm. There’s a dog show with a difference at 3pm. 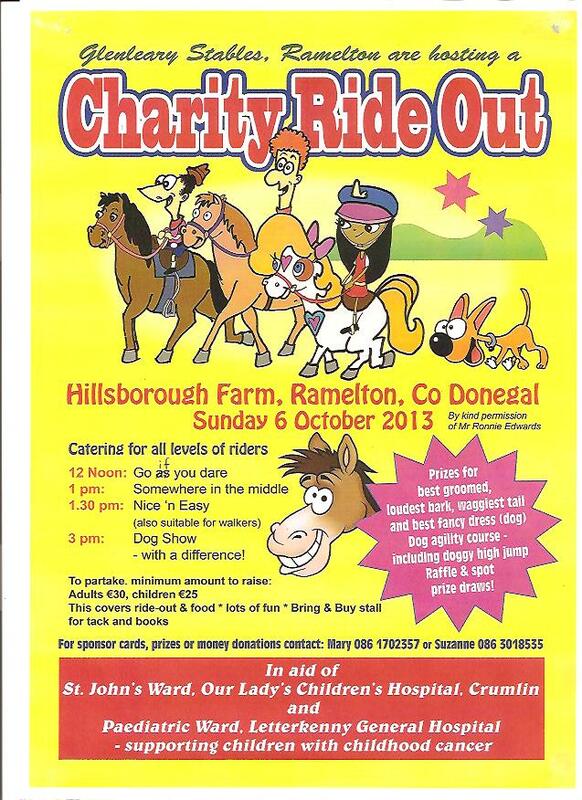 For full details see the Charity Ride flyer. This entry was posted in Non-Riding Club Events, Ride-outs, Social Life. Bookmark the permalink.